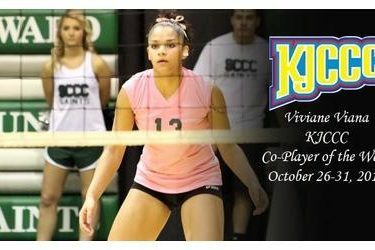 After helping lead the Seward County Lady Saints to a second place finish in the Jayhawk West standings in the final week of regular season competition, Seward County’s Viviane Viana has been named the KJCCC Co-Player of the Week for the final week of October. Viana came up big for the Seward County Lady Saints in their final week of regular season competition this week, averaging 2.88 kills and 1.88 digs per set while hitting .512 in two Seward wins. Monday on the road at Cloud County, Viana hammered down 11 kills on 20 swings in a 3-2 Lady Saints win. Thursday she backed that up with a nearly identical line with 12 kills on 21 attacks, good for a .524 hitting efficiency mark in a 3-0 sweep of Barton. The award is Viana’s first Player of the Week accolade. She also won Defensive Player of the Week earlier in the season. Viana and the Lady Saints open the first round of the 2015 Region VI Tournament tonight at home as they take on the Butler Grizzlies with the winner advancing to the tournament final four and the loser hanging up their shoes for the year.